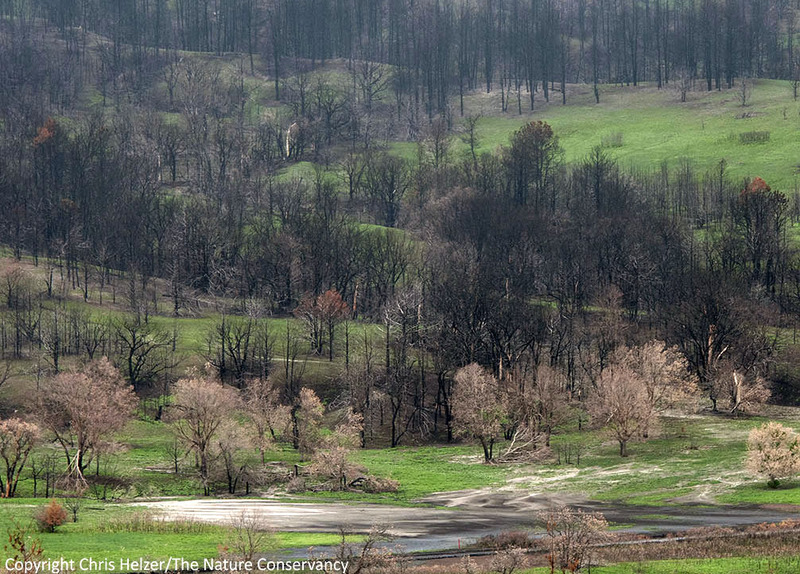 Spring is finally changing the color of The Nature Conservancy’s Niobrara Valley Preserve in north central Nebraska. 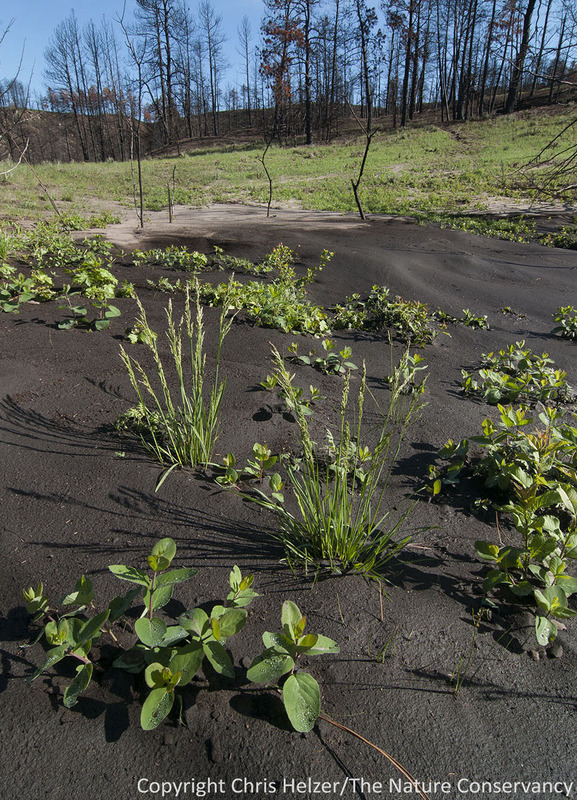 After last summer’s wildfire and drought, much of the Preserve was barren and brown all winter. Now, the area has had several small rainfalls during the last couple months, followed by a hard 3 inch rain on May 19. That moisture has combined with the (finally) warming temperatures, and the Preserve is starting to look green again. I traveled up to the Niobrara last week and took some photos to share with those of you who are interested in the site’s recovery. 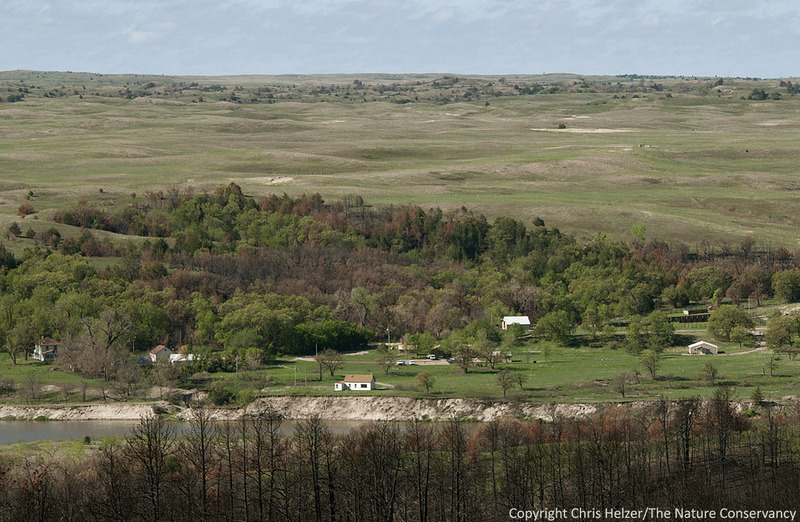 The headquarters of the Niobrara Valley Preserve with sandhills prairie behind. If it wasn’t for the ponderosa pine skeletons in the foreground, it would be difficult to know that a major wildfire had occurred last summer. 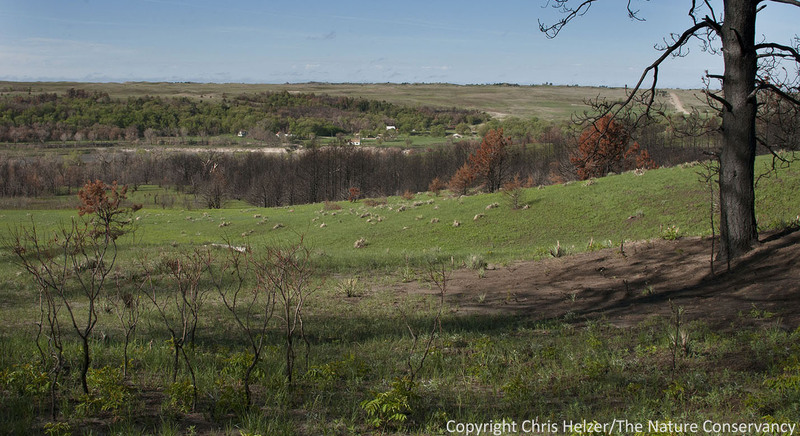 The prairie in the sandhills – as expected – is greening up very nicely. 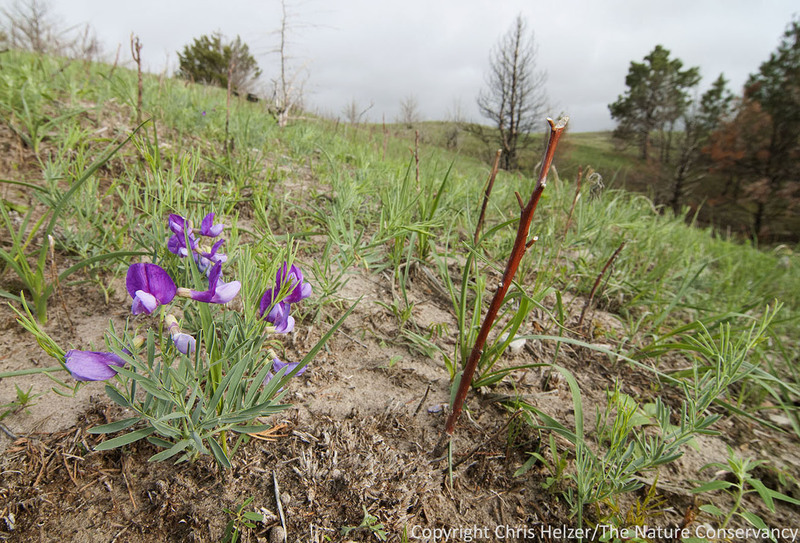 Many wildflowers are blooming, including this hoary vetchling (aka peavine or Lathyrus polymorphus). 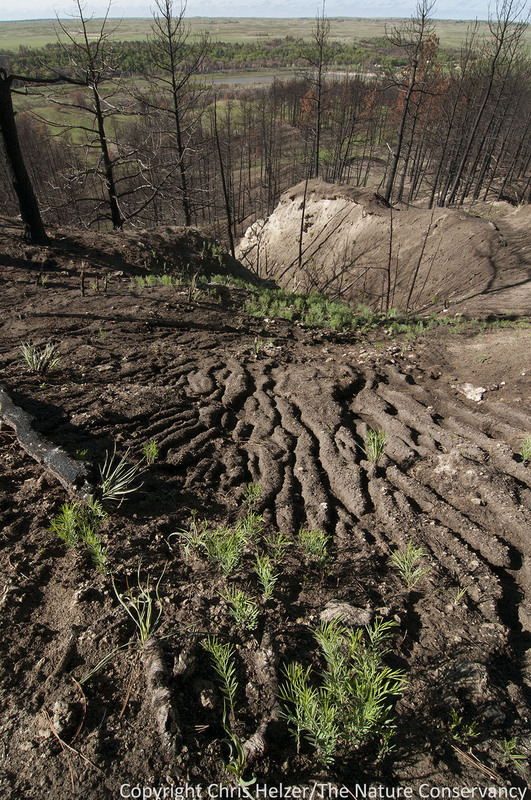 The recent big rain washed much of the remaining ash off the slopes north of the river. At the bottom of this photo, you can see the accumulation of the black goo that washed down. It was thick enough in some places that the road was closed while I was there last week. 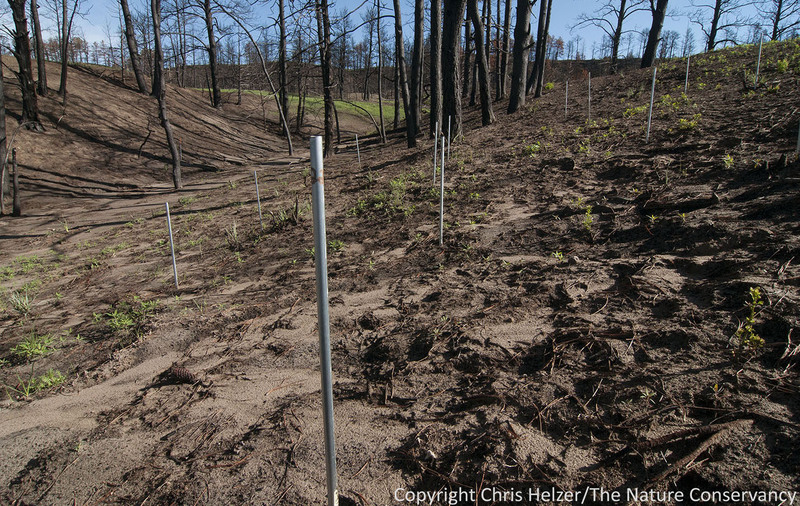 One of the things we’ve been watching for and wondering about is soil erosion on the barren slopes – especially underneath formerly dense stands of pines and/or cedar trees. When I arrived at the preserve, several days after the big rain, the road along the river was closed because of an accumulation of black goo that had washed off the slopes above it. 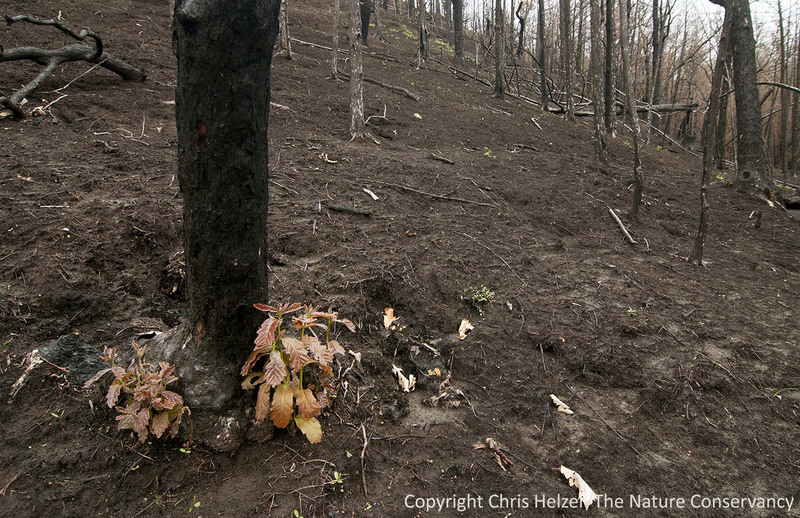 It was hard to tell, but it appeared to be mostly ash, mixed with some organic matter. Seeing that on the road, I was worried about what I’d find when I climbed the slopes. A closer look at the black goo, seen here in a low pocket further up slope. However, as I climbed the ridge north of the river, I was pleasantly surprised. There was some soil erosion, but much less than I’d expected. 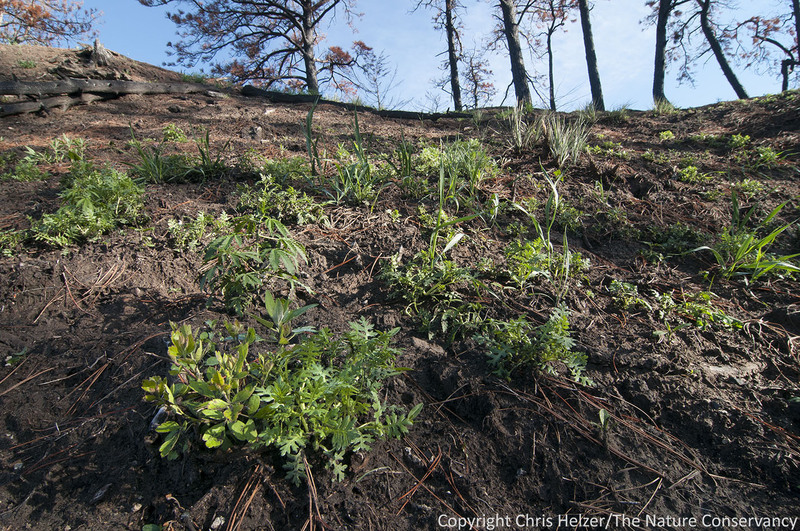 Green plants were popping up across the ridges, forming thicker carpets in areas where tree density had been lower. Green plants dot the upper slopes, especially in places where pines and cedars grew less densely. Annuals were abundant, including this Chenopodium species. Many of the green plants were “weedy” annuals, taking advantage of the sudden lack of competition for light and moisture. However, numerous perennials were growing too – including leadplant, puccoons, skeleton weed, peavine, several species of grasses and sedges, and many more. Perennial plants and shrubs were mixed in with the annuals. A the lower left of this photo is skunkbush sumac. Perennial grasses can be seen in the background. This was about as bad as it got for soil erosion on the steep slopes, and I had to look for a while to find many examples like this. Rather than large scale slides or obvious losses of top soil, multiple rivulets formed in many places. 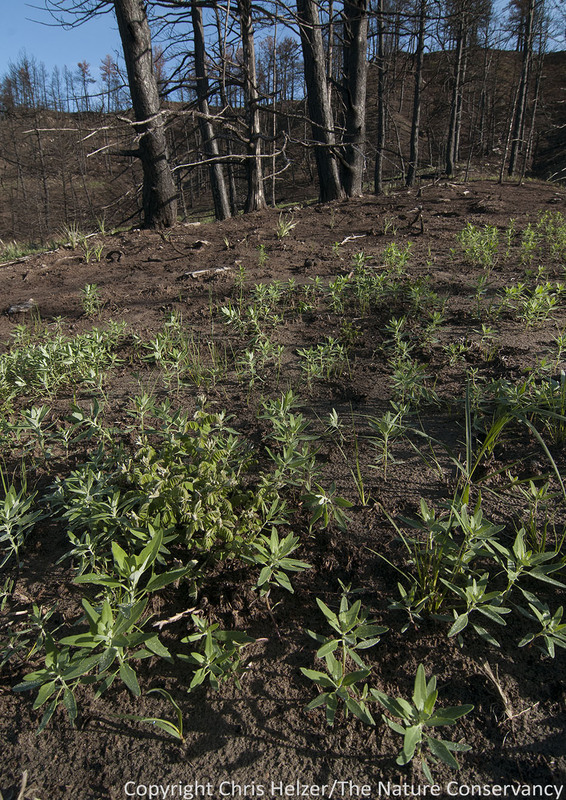 In between the rivulets, however, perennial and annual plants were growing and helping to stabilize the remaining soil. 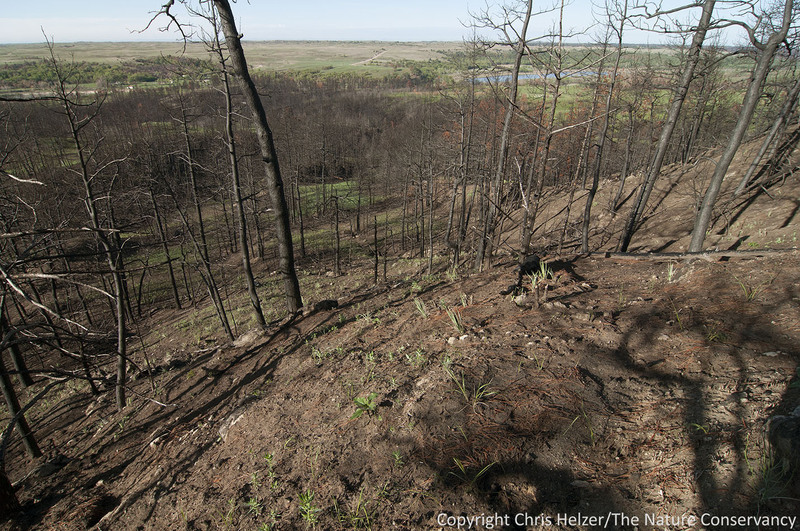 The lightest colored steep bluffs are mostly devoid of soil, but were like that prior to the fire rather than as a response to it. We have erosion pins in a number of places to help measure soil loss. The pins were installed in December and are being measured right now to see how much soil we’ve lost. The arrays of pins are located on a range of site types, varying in slope, aspect, and vegetation type. Additional erosion pin arrays will be installed in the coming weeks. Most oak trees were resprouting from their bases. Oaks that had been burned less intensely hadn’t started their spring growth at all this year, so it’s still unknown whether some of those will be able to continue growing from the ends of their branches. Unburned oaks were leafing out, so we should see something from the “lightly” burned ones in the next couple of weeks. 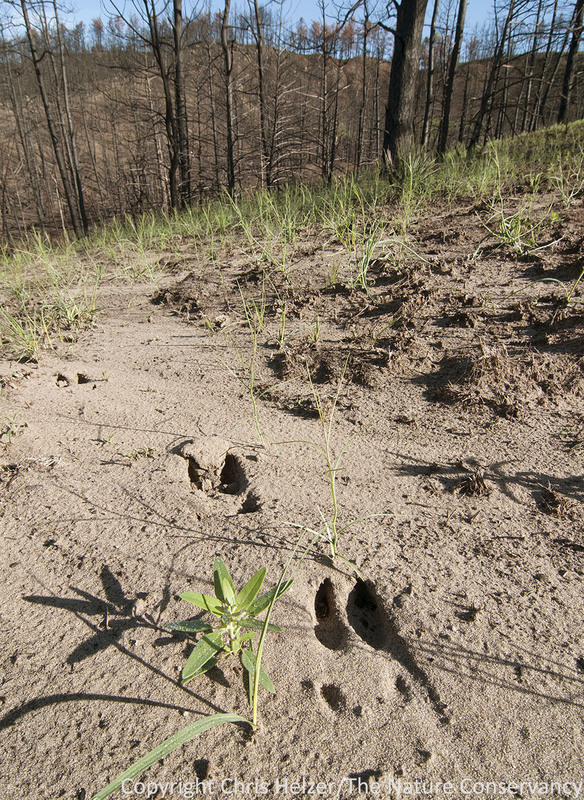 For better or worse, deer tracks were common. Some of the oak resprouts were clearly being nipped back by deer and/or other wildlife, as were sedges and other green plants. I don’t know what the future will hold for the Preserve, but I’m still optimistic. The sandhills and other prairies will clearly be fine. The woodlands will be slow to recover, but there are positive signs already. It’s hard to know how much erosion will occur or important that is. So far, even the most vulnerable slopes seem more resistant to erosion than I’d guessed they would be. Regardless, the Preserve is recovering, and will continue to be a beautiful place and important biological resource. And it’ll be very interesting to watch! Other than steep slopes where conifers were dense, the green up is well underway.